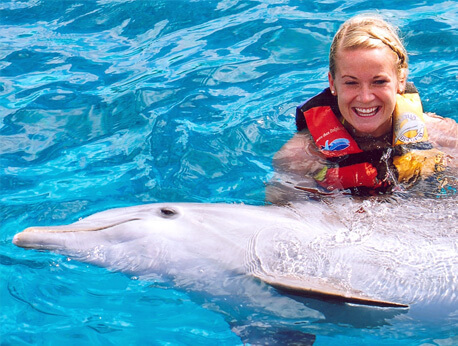 Enjoy an unforgettable adventure fit for the whole family with Dolphin Encounters! You'll swim, play and learn about these amazing animals in a once in a lifetime experience. These close contact dolphin encounters provide both unparalleled entertainment and education. Have you always dreamed of swimming with dolphins? Come experience the thrill of a lifetime with Dolphin Encounters in our beautiful Nassau, Bahamas location. Enjoy the clear, turquoise-blue water, breathtaking white sand beaches, and an unforgettable opportunity as you are joined by playful dolphins. Dolphin Encounters balances education and conservation with entertainment and fun providing you the opportunity to learn about these highly intelligent cetaceans in a unique environment. Let your worries float away with the water as you enjoy our one of a kind program. Before you get into our peaceful lagoon, you will be well prepared by our expert staff to gain the most from your experience. A brief, informative orientation will familiarize you with dolphin history, habits, and conservation. You will also be taught the Watchable Wildlife guidelines for marine life. This will allow you to approach the dolphins in a way that is enjoyable for everyone involved. Next, you will be fitted for a life vest and taken to the lagoon by catamaran. Once in the water, you will experience a whole new world unlike any you've ever encountered. Our expert trainers will guide you to the heart of the dolphin's society. Be transported to their world of joy as you swim, play, and interact with nature's comedians. Swimming with dolphins is believed to have many positive benefits, chiefly relaxing the mind and body. It is a truly life changing experience! Our experts will help you achieve maximum interaction with the dolphins, and will ensure you have the most rewarding experience possible. The finale of your visit will be the famous dolphin foot push. If you are not familiar with the term, a foot push is the unforgettable experience of being lifted from the water by two dolphins - one on each foot! For the safety of our dolphins and everyone involved, we do ask that you leave cameras and cellphones behind. Our professional photographers and videographers will be on hand to ensure that your experience is captured beautifully. You will leave Dolphin Encounters with unparalleled memories and the opportunity to take home a unique souvenir from your time in the Bahamas.